← Why Does It Get To Me? My older daughter and I seem to be arguing a lot these days. Actually, it’s been more than these-days, it’s been going on for, well, if I think about it, since she was about four. I guess since she found her will and realized that she could assert it (it starts way too early). So the other day I was trying to put some eye drops for her. She’s got something called Blepharitis, which is the swelling of the eyelids, usually happens in kids with dandruff, but in her case it’s not the reason (we could not arrive at one). It’s mild and can be treated with some drops and, believe it or not, shampooing of the eyelids! Now, every morning, as we try and make the most of each minute, as the school-bus looms large over the household, we have to shampoo her eyelids. And, as always, it’s not as simple as it sounds. Try waking up an eight year old at six in the morning and then scrubbing her eyes with shampoo (anyone who has washed a child’s face can tell you how they are about putting soap on their faces). So she screams, of course, and I try and tell her all the parental stuff about how it’s for her own good, which, she does not care about. All she wants is for me to stop lathering her eyes. There’s no magic, I tell her. If she can’t allow this then she loses all right to complain about hurt in her eyes. I wish it worked that way, but it doesn’t. Anyway, somehow we managed to make the bus. She waved from the window but had that I-don’t-like-what-you-did look. I chirpily waved back and saw that the twins were tying to make her smile. Next battle at 4:00, I thought. And man was I right. She came back from school, we had little time because she had to go for her tennis lesson and I had to put eye drops before that (because after the lesson there were more drops to be put). So after her snack, I announced that the drops had to be put. She revolted and I lost it. It’s for your own good, I repeated my morning words. She wanted to be left alone, which, of course, was too much to ask. I did the opposite. After trying everything – from sweet goading to open threats (ya, I know) – I had to pin her down and put them forcefully (in my defense, the last time she had Blepharitis we had to abandon the treatment half-way because she didn’t let me put the drops and I ran out of steam, so it reoccurred and this time it was worse). Most of our fights end with notes and apologies. She wrote this one hurriedly because she knew she’d upset me for no reason. Then she said “mama, can we forget that this fight happened? Please, let’s be happy” It made me think. A child reacts very differently to an argument than the mother. She took our fight to mean that she and I were not happy. For her it was vital that I forget the unpleasantness that had occurred, however fleeting or trivial. I sat her down and explained to her that fights didn’t mean we were not happy. It shook me up to think that she was sad to an extent that she wanted me to erase all that happened and pretend that we’d not fought. I wished I had been more patient, but in this case it was difficult because she was resisting all efforts to put the drops and since her infection had reoccurred, I was at my wit’s end. I am still unsure of what I could’ve done differently. But it made me sad to think that she took our fight so literally. And to think that the teenage years have still to come. It’s going to be fun, three teenage daughters at the same time. Can anything prepare me for that? I doubt it. 1. I loved that your daughter writes you notes to make up. 2. I think I am like your daughter after fights (I think something is terribly wrong and the world has ended), only with my husband and not my kids. With my kids, it’s obvious they’ve recovered from the ‘fight’ very quickly. 3. I don’t write notes. I used to but I stopped. Maybe I should. She writes notes when she’s upset and realizes that she’s done the wrong thing. I am saving them for the day when she’ll fly the nest and I’ll wonder why we fought..
You should start writing them again – it’s therapeutic.. Parenting is equal parts exasperation and guilt. how tenuous is a child’s hold over her world that an argument with a parent can make it slip out of her grip… and that is why we need to constantly reinforce that the world that we have created for our little ones will be anchored right here even after they fly the nest. and yes, you must keep this little “sorry” note . its precious beyond anything you can imagine right now. 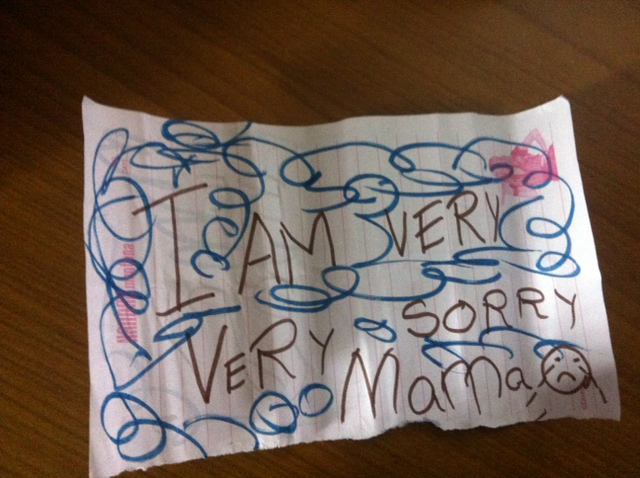 i have one such “sorry” card colourfully crayoned by my son, then a 5 year old. i keep it in my jewelry box.